This week, The Flash deals with the aftermath of Barry’s thrilling, not at all obvious discovery of Savitar’s real identity. They also still have to cope with Caitlin being Killer Frost and the addition of Tracy Brand to the team, and then there’s the matter of saving Iris. No matter who Savitar is, the “save Iris” plan is one that’s not going away for Barry and Team Flash, so they should be constantly working on ways to thwart Savitar’s dastardly murder plots. Not that “Cause and Effect” makes any progress on that front. I mean, it’s absolutely a fun and hilarious (and surprisingly meta) episode that I enjoyed, but in the grand scheme of things season plot-wise, we get nowhere. I’m just thankful that, unlike the hour of drudgery and pointlessness that was “The Once and Future Flash,” this episode actually manages to be entertaining. A lot of its saving grace was the dialogue, which really shines on The Flash whenever it’s allowed to get free and silly. But the real joy of the episode and the aspect that made me completely ignore the fact that it was just another week of filler, was the revisit of the old puppy-like Barry Allen I once adored. Ah, Puppy Barry. Unburdened by angst and trauma and selfishly destroying reality that one time... I have missed you. We start where we left off: Barry facing his future self as Savitar. Savitar tries to explain the timey-wimey nonsense that is this show now, saying that he’s a temporal anomaly or time hiccup or speed ghost or something. Insert shrug emoticon here. He calls Barry out on his timeline-ruining ways and Barry gets in a good burn on himself by saying Savitar isn’t so intimidating out of the suit. Grant Gustin is very good at playing Savitar Barry and I wish we hadn’t had so many weeks of pointless build-up because that mystery was stupid and we could’ve been watching Grant have fun playing an evil Barry Allen all this time. Anyway, Savitar runs off and no, I am not going to try to explain what Savitar Barry explained regarding the timeline or how he exists without Emo Barry from the Future knowing he exists or what Time Remnants have to do with anything. I’m not even going to try to explain Cisco’s explanation of the explanation that Barry gets when he returns to S.T.A.R. Labs. I am thoroughly done with The Flash’s time travel stories and everything connected to them. Bring us something else next season, I am begging you. Cisco gets the bright idea to erase Barry’s ability to create new memories in order to stop Savitar, since Savitar is Barry in the future and TIME STUFF! I’m not being sarcastic about Cisco’s plan, either — it’s legitimately a pretty creative, potentially effective plan to retroactively stop a future evil and I don’t think I’ve ever seen that solution on a TV show before. That being said, Cisco was never the brain expert on the team and his effort to “zap” the areas of Barry’s brain responsible for creating new memories results in Barry losing all of his memories instead. This sets us off on The Adventure of Amnesiac Barry, who bumbles around Central City, re-learning cool stuff about himself in the cutest ways possible. He learns his name is Bartholomew Henry Allen and decides he wants to go by “Bart”! He learns he’s engaged to Iris and looks like he can’t believe his luck because she’s really, really pretty! He learns he was in the Anime Club in high school! He’s basically like Barry from the first season, except somehow even dopier, and I want him to be the star of the show forever. Apparently so does Iris, who enjoys having a Barry Allen not bogged down by angst and dead parents and one erased Diggle baby. The more she realizes how carefree and adorable Barry is without his memories, the more Iris wishes they could just let him stay that way and have Barry re-learn how to be the Flash. I don’t think it helps that Iris’s first impression of Barry when they were kids was of “the happiest boy [she’d] ever met” and that happiness had slowly been chipped away from him over the course of losing his mother and becoming the protagonist of a CW superhero show. 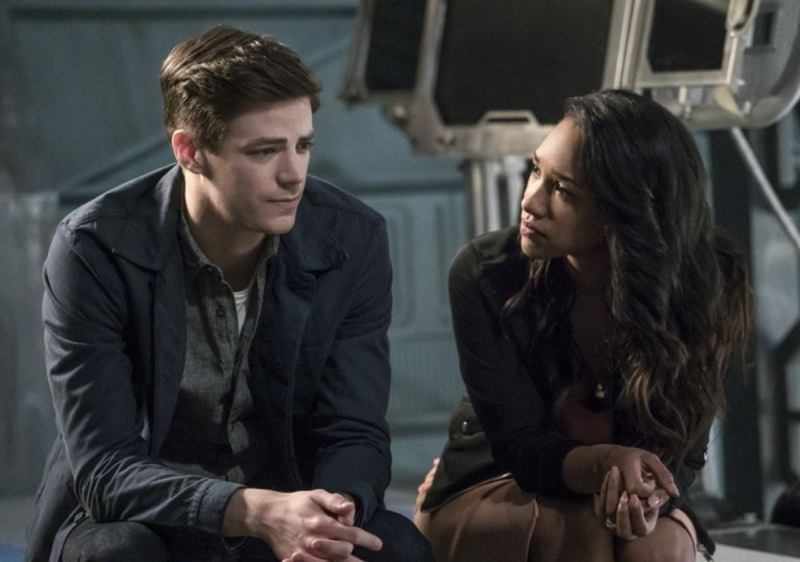 I completely agree with Iris, by the way, and even wished that the show would reboot with Amnesia Barry trying to re-learn how to be a superhero without all that doom and gloom holding him back. Like, I’d watch that show. It’d be better than the Agony Power Hour they’ve given us for the past season. Unfortunately for Iris and anyone else, myself included, who loves Amnesia Barry, there’s more than just fun, dorky Barry hijinks at play here and more potential danger than Barry accidentally falling in the hall. Barry having no memory means that Savitar couldn’t do his thing of handing out Flashpoint powers like Halloween candy, which in turn means that Wally doesn’t get his powers. Savitar himself, though he still exists, is just as memory-free as Barry but not nearly as fun — which Killer Frost can attest to, since she doesn’t like Amnesia Savitar so much she actually goes to Team Flash to get it all fixed. And, overall, Central City not having a version of the Flash who can be a hero and not having a Kid Flash at all makes the whole city vulnerable. Not only because of Barry not having his superhero memories, either — in fact, the main problem of the episode is set off because Barry lacks his knowledge as a CSI. Cecile calls Barry into the courthouse to act as the expert witness for a case against an arsonist/pyromaniac, but Barry has no memory of his life as a CSI. Cisco and Julian cleverly work up a pair of glasses they can use to feed the information directly in front of Barry’s adorable eyeballs, but fail to give it a decent amount of waterproofing. Barry sweats on the glasses, they throw some sparks, and Barry throws the case. I suppose it’d be pointless for me to wonder how the prosecution’s case was so flimsy that a single poorly constructed testimony from a single CSI managed to collapse the whole thing. When the pyromaniac gets set free, he immediately goes out to burn down another building (dude, lay low for a while, would you? Do you WANT to go to jail?) and it’s up to the Flash to save everyone inside from dying a fiery death. However, Barry without his memories is completely useless as a hero — which makes me wonder how Barry handled things like massive building fires when he was starting out as the Flash — and the brain-zapping mechanism that Killer Frost, Cisco, and Julian came up with doesn’t work without a memory jump-start. Iris provides that jump-start by tells Barry a memory of when he first came to live with the Wests, after his mother was murdered, thus giving up her (and my) chance for carefree Amnesia Barry to be the new star of the show. "My name is... Bartholomew Henry Allen. That's not a good name." "So what, I was like, brooding all the time before?" I loved the meta references to brooding Barry and how dismal his existence was, not only because they were cute little in-jokes, but also because it gives me hope that the writers know this dark and angsty version of the show cannot last and no one wants it to last. Amnesia Barry seeing his and Iris’s apartment and going, "This is our place? How do we afford to live here?" Like... do the writers read my tweets or what? "I just walked into a buzzkill." I’m using that one. Thanks, Amnesia Barry! Honestly I could quote so much of this episode in this section because, like I said, the dialogue was top-notch and wonderful. Sharp, funny dialogue and goofy comic book situations are what made me fall in love with this show, and this episode had so much of both. The relationship between Caitlin and Cisco is very compelling and should be explored more. Hopefully, after this episode saw a little bit of Caitlin in Killer Frost, it will be. Oh yeah, and Tracy Brand and H.R. are a thing, also they may have figured out the Savitar-stopping device. But we’ll probably learn more about it next time.